Rinse fillets and pat dry. Mix the flour and dry spices together and place in a shallow bowl. Beat eggs in a shallow bowl. Place panko crumbs in a Ziplock bag. Press both sides of fillets into flour mixture for a light dusting, shake off excess. Dip floured fillets into egg whites one at a time, allowing excess to drip off. Place fillets one at a time, in panko crumbs, lightly shake until both sides are covered. Heat oil in a skillet on medium high. When oil sizzles, add the fillets. Saute at 4 minutes per side or until fish flakes easily with a fork. 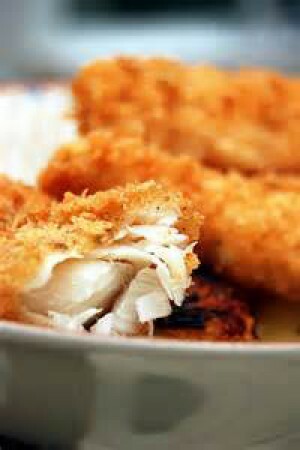 ***This recipe can also be baked at 400 for 25 minutes or until fish flakes easily with a fork. You can omit the olive oil.